Azusa Safety Gloves are made of a natural 10 Gauge Cotton/Poly blend, machine knit shell with textured latex palm coating. Thick blue latex performs well on wet surfaces. They're ideal for manufacturing, general duty, parts assembly, small parts handling, construction applications, metal handling, and gardening. 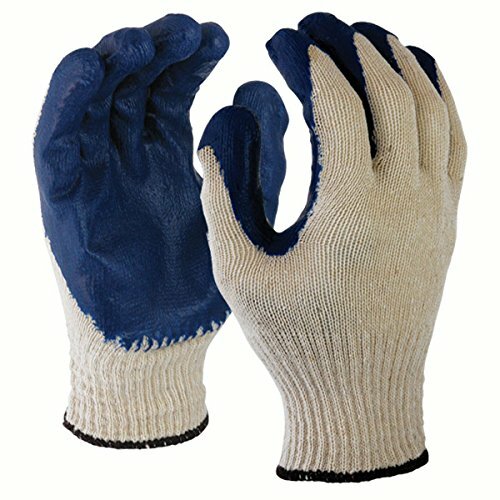 These safety gloves provide great comfort and fit due to its seamless knit construction. Available in sizes Large & X-Large in white/blue color combination. TEAR RESISTANT STRETCH FABRIC - 10 gauge 100% machine knit polyester/cotton blend. ASSISTED GRIP & VISIBILITY - Textured Blue Latex Coating Finish. EXCELLENT COMFORT AND FIT - Seamless knit construction. IDEAL APPLICATIONS - Construction, manufacturing, general duty, gardening, metal working, parts assembly. Available in sizes L & XL in white/blue color combination. If you have any questions about this product by Azusa Safety, contact us by completing and submitting the form below. If you are looking for a specif part number, please include it with your message.